Carolus Linnaeus (Linné) published the 10th edition of his systematic list in 1758. His Systema Naturae gave order to the species concept, with a generic and a subspecific name—the so-called binominal nomenclature; the tenth edition is regarded as the starting point of zoological nomenclature. This concept allowed scientists worldwide to recognize the same individual by the same name; the use of common names typically proved tremendously erring, as different countriesthen as they do now use different common names for the same species. This scientific principal unquestionably advanced science tremendously and is still in use today. Linné named on page 101 of Systema Naturae a bird, Psittacus aestivus, the generic name identifying it as a parrot and the species as a bird whose color reminded him of summer; the modern aestiva is the feminine form of the Latin adjective aestivus; the generic Psittacusat the time contained all psittaciformes. The species was identified as originating from “America” and was named from either a depiction in a painting or a bird imported by a mariner for a pet. No type specimen was assigned and thus we will never know what formed the basis for the description. Blue-fronted Amazon (c) Matthew Watts. This file is licensed under the Creative Commons Attribution-Share Alike 2.0 Generic license. “Corpus magnitudine Columbae, viride, dorso adsperso pennis luteis. Facies flava. Frons caerulea. Vertex albidus. Rectrices virides apice pallidiores: 1.2.3. bafi interior rubrae; at I et am lutere exterior caerulea. Humeri fulvi s. sanguinei. Remiges primores nigrae apice caerulescentes, latere exterior virides; secundariae anteriores latere extensive versus bafin rubrae. Rostrum nigrum. The description has one sentence of specific interest: the Latin Humeri fulvi s. sanguinei translates to red shoulders with yellow. These few words are relevant to this article as discussed later. READ Q & A: "What is better hand-rearing or using foster parents?" Nearly two hundred years after Linné,the type range was assigned as “southern Brazil” by C.E. Hellmayr in his Catalogue of the Birds of the Americas. This is the second important point. The type specimen is the individual used for naming of a species and is used as the reference for all other work involving that species and its taxonomy. What Linné identified was a bird whose plumage was green, had yellow and blue in the head and red and yellow at the bend of the wing. The color of the bend of the wing has become the single identifying feature that has separated the nominate (or first named) form from the subspecies described in 1896 by Berlepsch as Chrysotis aestiva xanthopteryx. (The generic Chrysotis was subsequently replaced by Amazona in J.L. Peters Check-list of the Birds of the World,in 1937.) Berlepsch named the bird xanthopteryx as a result of the presence of yellow feathers at the bend of the wing. The type for xanthopteryx originated from Bueyes in the Beni, Bolivia. Subsequent ornithological work refined the distribution: nominate aestiva had a range centered in the north-eastern Brazilian states of Pará, Tocantins, Piauí, Bahía, Minas Gerais, Goiás and MatoGrosso, with some also including as part of the range São Paulo and Paraná; and xanthopteryx occupying the area south and west of nominate aestiva, extending from south-western Brazil to eastern Bolivia, through Paraguay to northern Argentina. Within this large range one would expect variability in color, especially in the extent of blue and yellow. The problem is that reality does not come close to the postulated concept of two distinct, easily separable subspecies. Instead one finds birds with features of xanthopteryx within deep in the range of aestiva and vice versa, as well as a broad contact zone. There is also the issue of the description given by Linné, which clearly refers to birds from the contact zone—a fact reaffirmed by Hellmayr decades later when he assigned the range for aestiva as falling within the contact zone of the two subspecies. The widely accepted red (and only red) bend at the end of the wing used to distinguish aestiva does not seem tenable in lieu of Linné´s description. 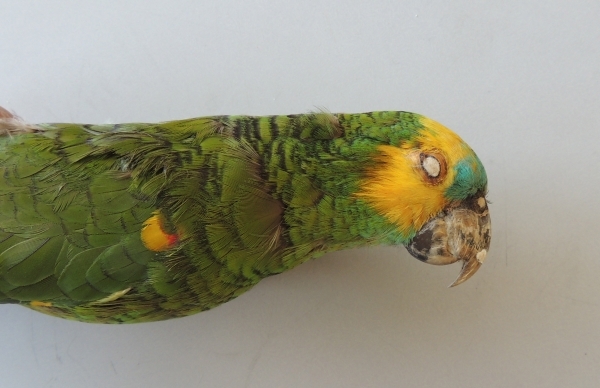 Typical Auá showing the golden yellow bib. The vernacular name has also been fraught with problem. In theory, aestivashould be called the Blue-fronted Amazon and xanthopteryx the Yellow-winged Amazon, a direct translation of xantho = yellow and pteryx = wing. 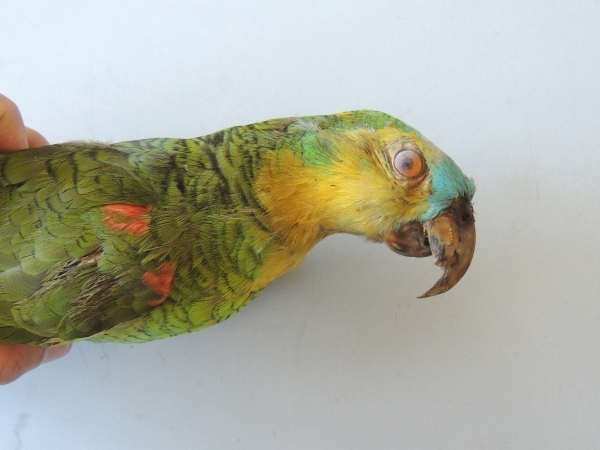 Aviculturists have often struggled to identify the subspecies and typically call all birdsin English Blue-fronted Amazon. 1) Since the specimen used by Linné cannot be examined, we really have no idea of the extent of red and yellow on the bend of the wing and, especially, the morphology of the bird (as will be discussed later). 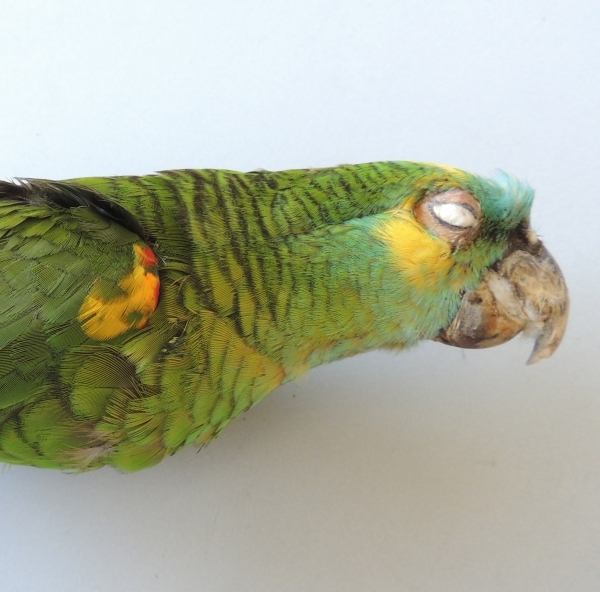 Linné´s description clearly rules out the form called Bahia in Europe and Auá (pronounced A-wah) in Brazil, which has a red bend of the wing, has a slimmer, more muscular body, exhibits sexual dimorphism (males have red bases to the throat feathers) and has an almost constant color scheme: the yellow (which forms a variable bib) is golden, the blue is pale and the plumage is a paler green. Here I refer to this form as Auá, which is the most common native Brazilian name for it; Bahia (as it is called in Europe) is a state in the north-east of Brazil and refers to only part of a broader distribution area for this distinctive form. Was the bird that Linné used (as suggested by his description) a hybrid from the contact zone, given the description of red and yellow and the subsequent assignment of the type locality to southern Brazil? 2) The form called Auá has both isolated populations (i.e., Serra das Capivaras and Serra dos Confuçoes, Pauí) and populations that come in contact with typical aestiva, with which it hybridizes readily. Is the core population of Bahia sufficiently distinct to justify being separated as a distinct species or subspecies? Does molecular genetics suggest it is distinct from other forms of aestiva? 3) The contact zone between aestiva and xanthopteryx is broad and even within the northernmost range of aestiva one finds individuals with yellow at the end of the wing, as specimens from Belém do Pará and Aragarças, Caldas Novas, Araguacema and Nova Roma in Goiás and held in the archives of the MuseuNacional in Rio de Janeiro and the Museo de Zoologia de São Paulo and also individuals confiscated by the authorities from trappers in Bahia, Brazil show. Does this mean that this species is so variable that it is impossible to separate the forms and that a single species concept applies? 4) Is there constancy in appearance in specific geographic areas, or is there variability in all populations in the extent of yellow and blue on the headand also in the presence of red and yellow or both colors on the bend of the wing? 5) What is the occurrence of individuals of blue-faced birds that lack almost all (if not all) traces of yellow from the face and found in parts of southern Brazil? Are they distinct from individuals from the Sierra de Santa Bárbara in the Argentine provinces of Salta and Jujuy? Do they also represent an undescribed subspecies? 6) Finally, how does one address the apparent incorrect nomenclature where Linné´s aestiva describes a bird whose features approximates that of xanthopteryx? Title photo: (c) Andrea. This file is licensed under the Creative Commons Attribution 2.0 Generic license. I just had to show my appreciation for the writer’s point of view on this subject by leaving a comment. Thank you for writing such top notch content for your readers. Thank you so much.